Back in 2005, when we started the application of S. cerevisiae boulardii in sows, certain farmers called us after 5-6 months to mention that they had to reduce the feed allowance in gestation in order to prevent the sows from getting too fat. This is what motivated us to look more closely into this effect. Yannig Le Treut, General Manager at Lallemand Animal Nutrition and an experienced swine vet, explains how the digestibility research started. By consuming residual oxygen in the sow caecum and colon, S. c. boulardii creates optimal anaerobic conditions for the growth and activity of cellulotytic bacteria. As a result, hindgut fermentation is improved, and more energy is released from the same diet in a shorter time. The positive effect of S. c. boulardii on part of the fibrolytic bacteria in the sow’s gut has recently been confirmed through metagenomics studies (Fig. 1)1. Inflammation has a huge metabolic cost for the animals. The resources used in the inflammatory response are not used for growth, leading to lower feed efficiency and higher feed conversion ratio. Several studies in humans and piglets (Collier et al., 2010) have demonstrated that S. c. boulardii has the ability to modulate the inflammatory response. A research project was conducted by INRA Pegase, in France, using metabolic chambers on fattening pigs used here as a model for sows. It proved a more efficient use of the metabolizable energy with the live yeast (Fig. 2)2. This could be even more important when transferred to sows, for which the amount of fiber in the diet is much higher. The effect of the probiotic on fermentation and energy metabolism is of great interest for all stages of the cycle but has an additional value in gestating sows. It can be applied through a partial energy substitution, partially compensating the inclusion cost of the additive, and still getting all the benefits of its application at farrowing time. 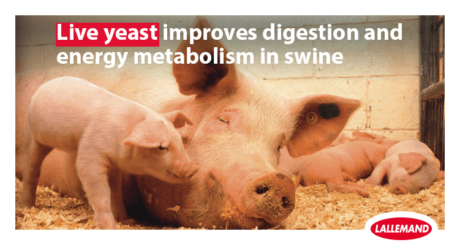 To know more about the European research project on the effect of live yeast on feed digestibility and energy repartition in swine, discover our dedicated technical article! 1Effect of live yeast Saccharomyces cerevisiae boulardii CNCM 1079 on abundance of Fibrobacteres, a family of fibrolytic microbes in sow hindgut (Lallemand Animal Nutrition, internal data, 2016). 2Effect of live yeast Saccharomyces cerevisiae boulardii CNCM 1079 on the ratio between retained energy and metabolizable energy in fattening pigs (INRA Pegase, 2015).